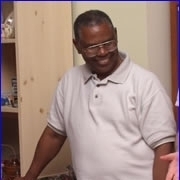 I'm Stan Domino, a 62-year old African-American. A year ago, on December 6th, I was diagnosed with prostate cancer. By most people's account, that was bad news. It was bad news by my account also. However, being an optimist, I found the good news that this was an early stage prostate cancer. You see, some 27 months prior to December 6, 2000 I had a PSA prostate specific antigen reading of 17.6 ng/ml and my urologist thought for sure I had prostate cancer. He was wrong, that time. The elevated PSA had apparently been caused by prostate infection, so he scheduled me for three-month DREs and six-month PSAs. That was a good thing to do. The better news was that I decided to do some research that included friends, printed material, and most importantly the internet. I'm an engineer by trade and the more data points I have to consider the better I feel about the quality of my decision. I read what I suppose most men read but because of the comments of my urologist I also sought information on prostate infections and cancer. I also discovered there is such a thing as data/information overload, so the last article I was going to review was about something called laparoscopic radical prostatectomy, LRP. The next morning, as I was about to email, I decided to call instead. To my utter surprise, a real person in the doctor's office answered at 8:00 a.m., and to my complete amazement, it was Dr. Krongrad himself. After discussing my situation and ascertaining I was a three-hour drive away from his Miami office, Krongrad agreed to see me at 4:30 p.m., same day. That was the beginning of a perfect union of surgeon, patient, and procedure, LRP. I should add that without Ruth in Dr. Krongrad's office, the whole experience would have been administratively much harder. I can't remember ever having dealt with a doctor's office that felt so little like a doctor's office: friendly, cooperative, accessible, responsive, and effective. If you're going to be sick and need surgery, the last thing you want is a bureaucratic hassle and attitude. Thank you, Ruth, for making it so easy. I had my operation six weeks after prostate cancer detection and was out of the hospital the morning after surgery. No big deal. My wife of 34 years and I drove the three hours home the day after that. Other than a sore bottom, I had no problems. I was even able to sit through weekend class within a week of my prostate cancer surgery. That meant a lot to me, to be doing the things I needed to do. My wife of 34 years and I couldn't be more happy with the outcome. When I had my laparoscopic radical prostatectomy, few folks around had heard of it. I knew how much it helped me that the pioneers who had gone before me had spoken out on their experience. One of the things I did after my LRP was talk to others who were now in the shoes I had been in just a few weeks before. I could hear the tension in their voices dissipate as they heard my story. To give back a little to the next guy down the line ... that's the least I can do. First he got information on prostate infections and cancer. Then was was diagnosed with early stage prostate cancer.